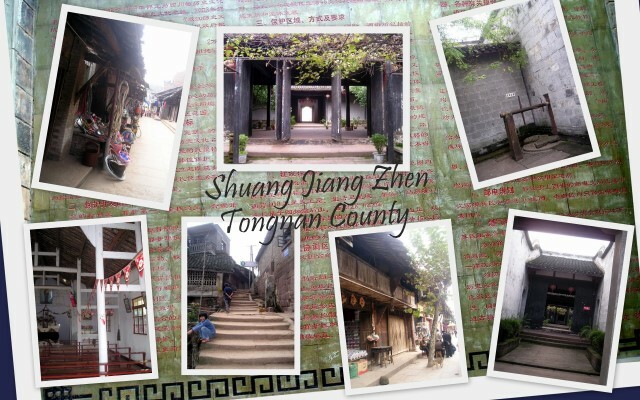 Tongnan County in the far northwest of the municipality has an interesting collection of scenic and historic sites including the ancient village of Shuang Jiang 双江. Shuang Jiang is the ancestral home and birth place of one of China\'s famous sons, a friend of Mao\'s and founding member of modern China. Yáng Shàngkūn 杨尚昆 (1907�C1998) held the Presidency of the People\'s Republic of China from 1988 to 1993 He was also permanent Vice-chair of the Central Military Commission and is considered one of the Eight Immortals of Communist Party of China. The Yang family courtyard home has been renovated and is now open to the public along with several other buildings belonging to relatives of this historic and affluent family. On the outskirts of the village is a small local church housed in a well preserved traditional timber courtyard building and gardens more that 70 years old. Tongnan County is also home of the Giant Buddha Temple 大佛寺 with its magnificent gold Buddha, standing almost nineteen meters tall with ears a massive 2.74 meters long. Many stone cliff carvings and sculptures can be found in the surrounding hills. The springtime flowering of rapeseed or canola plants also draws large crowds to Tongnan County to view the spectacle as broad terraced farmlands turn from brilliant greens to golden yellows. A new motorway, G93 to Suining and Chengdu links Tongnan County to Chongqing city in less than 2 hours. Shuang Jiang is a further 10 kms north of the city.